Now that Drools 5 has been released, we're already working on the new features for the next release. I'll be adding some blog entries over the next few weeks about what we are planning to do for Drools Flow, and this is the first one. 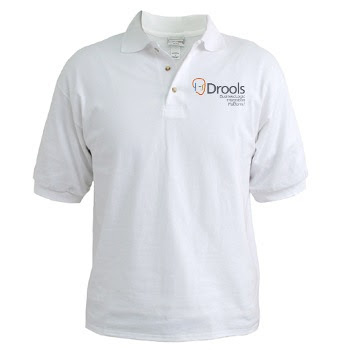 Most of the work so far regarding Drools Flow has focused on creating a runtime for executing processes and the "hooks" to integrate that into your application. This involves APIs for starting processes, checking the status of running process instances, etc. Developers could use this API to retrieve the information they needed. There was however no easy way for non-technical people to access this information. 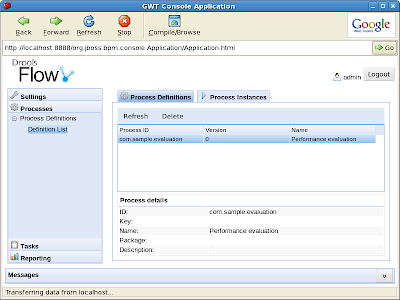 Heiko Braun has recently been working on a Business Process Management console which allows you to do just that ! 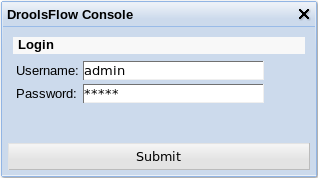 And the console itself is completely pluggable, meaning that you can link in your own process engine implementation and extend the various views. So that is exactly what we did ! The following screenshots show how this all looks like for a very simple employee performance evaluation process. First you need to log in (role-based access control). In the processes section you can get a overview of all the processes in your knowledge base, which is loaded from Guvnor. In this case, there's only one sample process called "com.sample.evaluation". 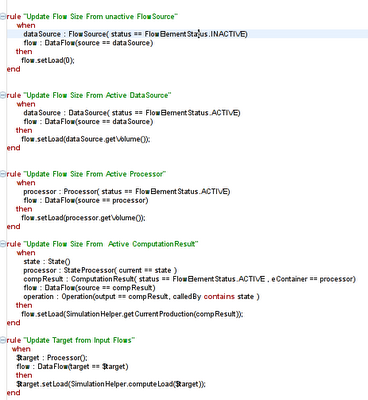 You can then get an overview of all the running process instances for that process. Since there are none, we quickly start a new one, after which we have one running instance, as shown below. You can also get an overview of the current status of a specific process instance. 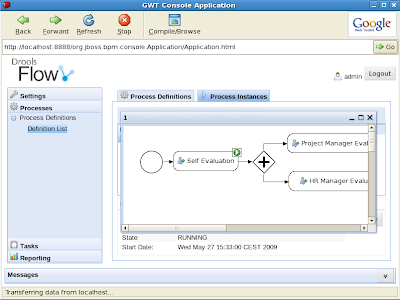 In this case, our evaluation process is waiting for the user to perform a self-evaluation first (which is modeled using a human task node assigned to this user) before continuing, as shown by the icon in the top right corner of the node. When switching to the task section, you can get an overview of all the tasks that a user can claim or that are assigned to him / her. 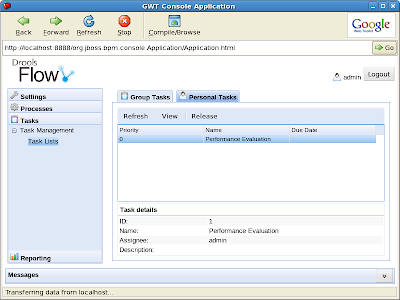 In this case, there's only one task assigned to this user, which is the evaluation task created by starting our sample process as shown before. The user can then execute his task. A task form linked to the task in question is then shown. These task forms can be created using freemarker templates and can ask specific input from the end user, which will then be returned to the process. This example shows a simple task form where the user has to fill in some evaluation questions and complete the form. 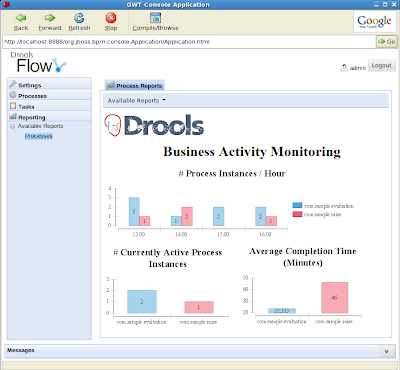 Finally, the report section allows you to view reports that show the history and/or current status of your processes. These reports are created using the Eclipse Business Intelligence and Reporting Tool (BIRT). This report for example shows the number of processes started (in the last few hours), the number of still active process instance and the average completion time per process. Users can define their own custom charts to monitor the key performance indicators of their business, based on the history data of the process engine and any other data sources available. I have just sent out a group email to those that registered for the San Francisco boot camp. If you are planning to attend and did not receive an email or would like to attend and have not yet registered, then please contact me asap - mproctor at redhat d0t com. We have a few spaces left, so if you want to attend, hurry. 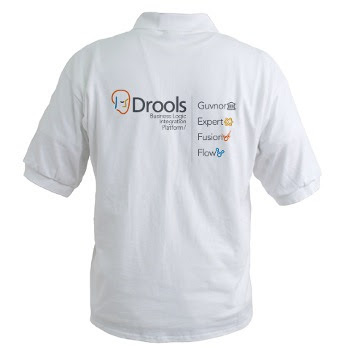 Drools T-Shirts can now be bought from CafePress here. Notice (thanks Edson) that this needs to be done only once. [MyMultipleEvaluatorDefinition] must register the different Operators. Also take care that getEvaluatorIds() returns all the ids. A user could otherwise have an object capable of evaluating different properties. Suppose, for example, you have a Neural Network trained for Optical Character Recognition. For the unfamiliar readers, such a NN is a classifier which processes a bitmap image and returns the character which most resembles - in the sense of probability or similarity - the shape in the image. Whatever the case, the Evaluator, e.g. the network, has more than one imperfect outputs, each one with a different symbolic label. Notice that this, independently on the chosen solution, is an option for the easy creation of hybrid intelligent systems, mapping a connectionist module such as a Neural Network onto a symbolic structure such as "resembles" or "isX". 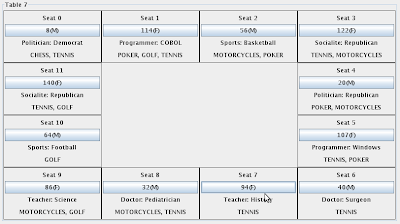 This is not trivial. To return a degree, SeemsEvaluator invokes the right Evaluator on the left field. This is a callback to the evaluand, which provides the appropriate Evaluator itself. The (unary) Evaluator must be the pattern object itself, or can be stored in a field. Again, "evaluates" feeds the result of the right expression to the left Evaluator and returns the result. -- thanks to Edson Tirelli for some precious advice on how to improve this post! This is for those who are either on twitter, or coming to the San Francisco boot camp (or both !). So I have created a DroolsRules twitter account: http://twitter.com/DroolsRules for drools things - follow this to be notified of what is happening, specifically to do with the boot camp if you are coming (or are just curious). Now, one other nice thing, is if you follow it, I can follow you back: send a "direct message" to DroolsRules and it will be echoed to other followers. If this is all wierd jargon to you, don't sweat, its simpler then it sounds ! See some of you soon in SF ! 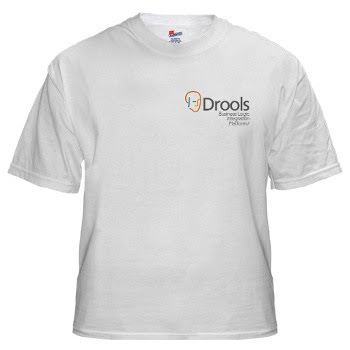 The Drools team are pleased to announce the release of Drools 5.0 Final. Everyone's favourite Java Rule Engine with the delivery of version 5.0 gives genesis to the Business Logic integration Platform, which provides a unified and integrated platform for Rules, Workflow and Event Processing. It's been designed from the ground up so that each aspect is a first class citizen, with no compromises. Guvnor is our web based governance system, traditionally referred to in the rules world as a BRMS. We decided to move away from the term BRMS to something based on governance, as our long term emphasis is no longer rules specific. Expert is the traditional rules engine. Fusion is the event processing side, it's a play on data/sensor fusion terminology. 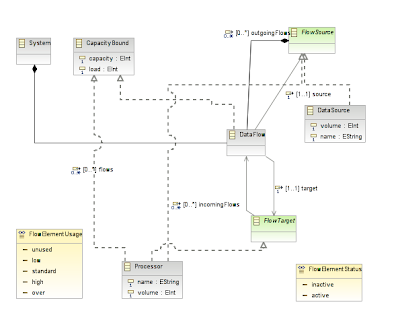 Finally there is Flow which is our workflow module. "There have been many definitions of hell, but for the English the best definition is that it is the place where the Germans are the police, the Swedish are the comedians, the Italians are the defense force, Frenchmen dig the roads, the Belgians are the pop singers, the Spanish run the railways, the Turks cook the food, the Irish are the waiters, the Greeks run the government, and the common language is Dutch." A couple of weeks ago James Owen proposed a larger Miss Manners benchmark for rule engines on his blog. Last weekend he posted the first dataset, so this weekend I took it upon myself to implement this "Manners 2009" as an example in drools-solver. Drools-solver solves this planning problem. As you can see, all constraints are met. I estimate I've implemented this example in roughly 14 working hours (including the GUI work). 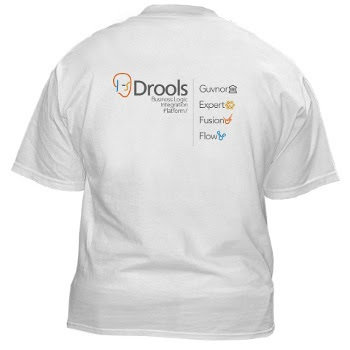 So, with drools-solver, planning problems are easy!